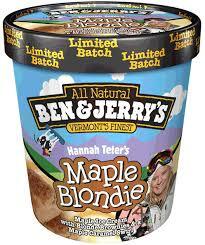 Ben & Jerry’s -$1 Maple Blondie Ice Cream Today Only! If you are near a Ben & Jerry’s Ice Cream store, today only (Wednesday March 3rd) you can get a scoop of Maple Blondie ice cream for just $1! They’re celebrating Hannah Teter’s Silver medal in Snowboarding in the Olympics and all you need to do is say “Way to go Hannah”, to get your $1 scoop! You’ll get a scoop of Maple Blondie which is Maple Caramel Swirl and Blonde Brownie Chunks. Look for a Ben & Jerry’s location near you! Here are the WA locations: Gig Harbor, Auburn (Lakeland Hills), Southcenter Mall, Green Lake/Seattle, Kirkland & Riverfront Square/Spokane. The OR locations are: Eugene, Portland Pearl District, Yamhill/Portland, Clackamas Town Center, Hawthorne/Portland, Uptown Center/Portland, Bend, & Eugene (Coburg Rd area). The only Idaho location is downtown Boise. Thanks for the tip, FB Fan Aleigha!